Thomas V. Telder, passed away on September 28, 2018, at the age of 88. Born in Grand Rapids, Tom was the son of Adrian V. Telder and Sara Speyer Telder. Tom is survived by daughters Sara and Jim Tisdel, Kathy and Mike Floch, Lisa and Bob Bowman; grandchildren Kelly, Kyle, Jordan, Anna, Emily, and Jack; and 5 great-grandchildren. A man of the world, Tom traveled widely, lived abroad, was an enthusiastic storyteller, and always had a listening ear for the stories of others. Tom gave people space to be themselves, and they felt at ease in his presence knowing that he saw the best in them. 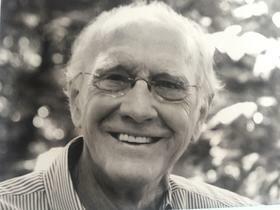 Tom was passionate about politics and the beauty of Lake Michigan, and he prized education, having earned a doctorate. Tom loved his family and dear friends with everything he had, and we have been infinitely blessed and honored to be loved by him; we are forever changed for the better because of him. There will be a memorial gathering on October 27 at 1:00 PM, with light refreshments afterwards at the Kirby House, 294 W. Center St., Douglas, MI. In lieu of flowers, please consider a donation to the Saugatuck Dunes Coastal Alliance, PO Box 1013, Saugatuck, MI 49453. Arrangements are by the Dykstra Funeral Home-Mulder Chapel.